28 September 2018, 11:11 a.m. According to the latest worldwide market study by 451 Research, new survey results suggest most organisations are adopting or considering artificial intelligence (AI) and machine learning (ML) due to its commercial growth benefits, rather than the potential to cut jobs. Despite being somewhat new, there's adoption momentum for the technology. Almost 50 percent of their survey respondents have deployed or plan to deploy machine learning in their organisations within the next 12 months. 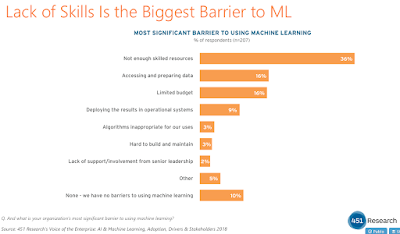 Therefore, this paints a more optimistic picture of machine learning adoption than is often portrayed by other industry analysts. "Out of many possible benefits we presented to our survey respondents, 49 percent cited gaining competitive advantage as the most significant benefit they have received from the technology," said Nick Patience, vice president at 451 Research. Improving the customer experience came a close second, cited by 44 percent of respondents. Despite all the hype around mass job losses, lowering costs was cited by only a quarter of the survey respondents. He added, "We think this demonstrates that AI and machine learning is an omni-purpose technology that can bring numerous benefits to organisations, beyond just lowering costs through increased automation." That being said, there are still some major obstacles that inhibit progress. When asked "what is your organisation’s most significant barrier to using machine learning?" most cited a shortage of skilled resources as the top barrier (36 percent). According to the 451 Research assessment, skilled talent for machine learning projects usually means proven data science skills and experience. And a lack of those capabilities is reinforced further by the finding that data access and preparation is the second biggest barrier cited by survey respondents. However, 451 Research expects the lack of skills and experience to gradually decline as a barrier when AI tools become easier to use, and the population of users who can leverage machine learning expands. Organisations will need to ensure their machine learning deployment brings the business benefits that matter most to their stakeholders. To learn more about the commercial impact that AI and machine learning might have on your organisation, consider researching the application of 'quick-start solutions' that enable rapid testing and deployment. Moreover, some forward-thinking vendors are already addressing the bigger challenges that face enterprise developers and data scientists. To help CIOs and CTOs scale projects, smart vendors offer high-performance server platforms and integrated software that will enable organisations to extract better results from their available data and accelerate the reporting of actionable insights. Interested in finding out more around enterprise AI use cases and how AI and big data will converge? The AI & Big Data Expo World Series is coming to Silicon Valley on November 28-29 2018 - find out more here.